Voters in the monthly Yahoo! 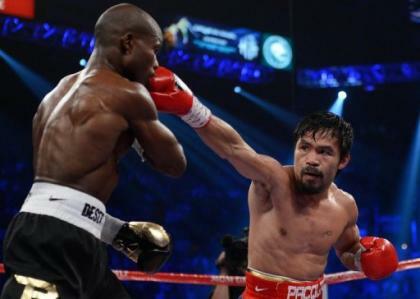 Sports boxing poll faced a difficult decision when compiling their ballots for the June rankings: What to do with Manny Pacquiao and Timothy Bradley and how to regard the outcome of their controversial June 9 bout. Most of them simply chose to ignore the outcome, though it is clear that Pacquiao's performance in his split-decision loss to Bradley at the MGM Grand Garden didn't sit well with voters. Floyd Mayweather Jr., who on May 5 scored a wide unanimous decision over Miguel Cotto, increased his lead over Pacquiao in the race for the top spot in our poll. In voting taken for May's poll shortly after Mayweather's win, he received 29 of 39 first-place votes, or 74.4 percent of all votes cast. In June, in voting done shortly after Pacquiao-Bradley, Mayweather received 36 of 44 first-place votes, or 81.8 percent of all votes cast. So, 7.4 percent of the voters opted to decrease support for Pacquiao in favor of Mayweather. I am just one of the 46 overall voters on the panel (two failed to submit ballots in June) and my vote counts no more than anyone else's. But I chose to drop Pacquiao from two to three on my ballot, with Mayweather and Andre Ward ahead of him. I scored Pacquiao's Nov. 12 fight with Juan Manuel Marquez a draw, 114-114. Though I believe Pacquiao deserved to win the fight with Bradley, let's not forget that Pacquiao couldn't put away a guy who fought on a foot with a torn ligament for 11 rounds. And worse, Bradley injured his right ankle in the fourth or fifth round. So while Pacquiao looked better against Bradley than he did against Marquez, he's now coming off two fights in which he was not at his best and couldn't put away a clearly injured, and limited, fighter. Ward is a low-key guy and doesn't have the most exciting style, but he's extremely effective and has been beating quality opposition by a wide margin. That has to count for something and so, in my poll, I pushed him past Pacquiao. Eight of the 44 voters this month chose to keep Pacquiao first. He was also voted as low as seventh by one. As for Bradley, I moved him to fifth. I felt that though he lost, he performed very well against one of the elite fighters in the world. Having done so on injured feet only makes his performance all the more impressive in my mind. For the record, my votes this month were, in order, for Mayweather, Ward, Pacquiao, Marquez, Bradley, Nonito Donaire, Sergio Martinez, Wladimir Klitschko, Vitali Klitschko and Carl Froch. Analysis:Will he be same boxer after jail sentence ends? Up next:Sept. 8 vs. Chad Dawson in Oakland, Calif.
Up next: July 7 vs. Jeffrey Mathubela in Carson, Calif.
Others receiving votes: Miguel Cotto, 31; Chad Dawson, 28; Yuriorkis Gamboa, 26; Chris John, 11; Anselmo Moreno, 7; Roman Gonzalez, 6; Amir Khan, 2; Abner Mares, 2; Canelo Alvarez, 1; Adrian Broner, 1; Lucian Bute, 2; Julio Cesar Chavez Jr., 1; Guillermo Rigondeaux, 1. Voting panel:Al Bernstein, Showtime; Ron Borges, Boston Herald; Damian Calhoun, Orange County Register; Brian Campbell, ESPN.com; Scott Christ, Bad Left Hook.com; Steve Cofield, ESPN Radio 1100; Dave Cokin, ESPN Radio 1100; Mike Coppinger, Ring; Gareth A. Davies, London Telegraph; Tris Dixon, Boxing News; Jake Donovan, BoxingScene.com; Andrew Eisele, About.com; Corey Erdman, Sirius/XM; Steve Farhood, Showtime; Thomas Gerbasi, BoxingScene.com; Nick Giongco, Manila Bulletin; Carlos Gonzalez, Primera Hora; Randy Gordon, Sirius/XM; Bryan Graham, Sports Illustrated.com; Lee Groves, Ring; Rafael Hernandez Brito, Univision; Keith Idec, The Record; Kevin Iole, Yahoo! Sports; Max Kellerman, HBO; Scott Mallon, Boxing Digest; Chris Mannix, Sports Illustrated.com; Rich Marotta, Fox Sports; David Mayo, MLive.com; Franklin McNeil, ESPN.com; Gunnar Meinhardt, Die Welt; Robert Morales, Los Angeles Daily News; Marty Mulcahey, MaxBoxing.com; Kieran Mulvaney, Reuters; Santos Perez, Miami Herald; Martin Rogers, Yahoo! Sports; Cliff Rold, BoxingScene.com; Mike Rosenthal, Ring; Lem Satterfield, Ring; tim Smith, New York Daily News; Tim Starks, The Queensbury Rules; Don Steinberg, Philadelphia Inquirer/Wall Street Journal; T.K. Stewart, Ring; Dave Weinberg, Press of Atlantic City; George Willis, New York Post.